For those of you that know me, you know that I was a personal trainer for almost 5 years. I helped countless people over the years reach their fitness goals. My emphasis was always on health over aesthetics, but it’s easy to get confused when you are dealing with weight loss. People paid me to not only feel their best but to look their best. I always found this to be a difficult balance to teach. It is true that when you are at a healthy weight you feel better about yourself, but size or weight should never be a measurement of worth or a motivation for work. The ambiguity and fine line between health and vanity is one of the many reasons why I left the fitness industry. I loved helping people see that exercising your body and eating whole “God-made foods” is your duty as a good steward over your body, that precious gift given us by a loving Father in Heaven. Fitness and dieting should always be founded on that principle. But so often it is not. So often it is about getting ready for a cruise, wedding or something else superficial. And honestly, my clients who’s main motivation was “getting to a certain size” or looking a certain way by a particular date, always struggled more to lose weight and to keep it off than those with the right motivation. I found, time and time again, that people got sick of my “do it for your health” and “love the body God gave you” speeches and just wanted me to get back to “cracking the whip” and “punishing them” for the huge piece of cheesecake they splurged on the night before. Somewhere along the way a light went off in my head and I realized I was in the wrong business. People were paying me to help them change their body, not their mind. And what I wanted to do was to change their mind. So this is my last and final attempt as a personal trainer to all my past clients, friends and specifically the women in my life to help facilitate a healthy body image and ultimately a healthy self-image. I hope that after you read this, you will never again step on a scale to measure your worth. Interestingly enough, it became clear to me that my clients are not the only people who need to make a change in how they view themselves. People with weight issues are not the only ones who try to measure their worth with outside calibrations. This problem of “measuring yourself” is a problem in so many other areas. It spans almost all aspects of our lives. Measuring, comparing, and weighing are all corrosive to confidence and self-esteem. I did a lot of soul searching to discover the “measuring sticks” in my life and there were many. What are you measuring yourself by? How do you weigh your worth? Is it found in dollar amounts? Is it found in price tags? Is it found in your beauty? In the cleanliness of your house or the newness of your things? Is it found in what you possess or in how you present yourself? Is it found in your clothing size? I am sure that many of you would say no to all of those things. But examine yourself, really examine yourself and you might be surprised. What motivates you to do what you do everyday? Does it involve one of those measuring sticks? What do you spend most of your time doing? How do you determine what makes a good day, a good life or a good person? 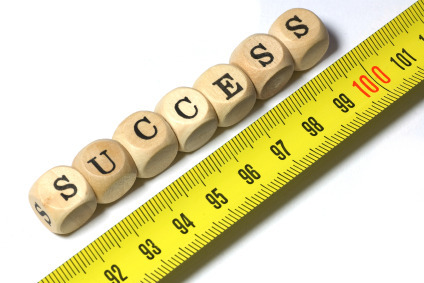 Do you feel that a good life involves measurable achievements? We are certainly taught that by the world. No one’s value can be measured in numbers. No one. Your worth does not depend on the number on a scoreboard, a mile marker on a road, a grade or degree, and of course a number on the scale or on a clothing tag. Your value and worth cannot be measured by any quantitative process on earth. Numbers do not count! Small acts of kindness, your ability to forgive, the prayers of your heart all speak louder to your worth than any earthly achievement or measurement you can attain to. Real beauty never ages, never fades and never goes out of fashion. Real achievement is not a score, time or grade. Real beauty, real achievement comes as you follow the footsteps of the One who has accomplished All and who’s countenance lacks no Beauty! Our body image, our self-image should be the image of Christ! When you have His image in your countenance, and when He becomes your strength there is nothing you cannot do! Our confidence should come from him, not from man. “It is better to trust in the Lord than to put confidence in man.” (Psalms 118:8) Let us not put our confidence in the hands of others. Let us put our confidence in God. There is no other person we should seek to imitate. Any worldly achievements vanish and fade. Your accomplishments should be measured by how closely you come to resemble Him. The next time you are tempted to judge yourself by what you see on Pinterest, or any other worldly standard, please remember Christ is the Standard. Your worth is unchanging and immeasurable, as is His love for you. There is no scale that will ever tell you that.